A good book, fast-paced, interesting story line. An easy book to read which emulates the style of Dan Brown’s “The DaVinci Code” or Steve Berry’s novels. Rick Carson has it all; money, good looks, fame and a grandfather who is one of the most powerful men in the world. When he finds his father murdered in their home in Montana, the security system shows no signs of tampering and he’s the prime suspect. Not knowing who to trust, he turns to the first responding law enforcement officer on the scene, Shannon Bridges. She seems to want to help him, but she’s not what she seems. 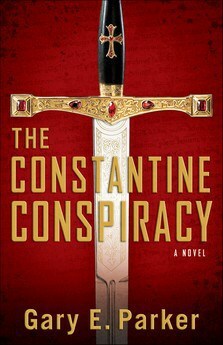 Suddenly, Rick and Shannon find themselves in the middle of a 1700-year-old conspiracy that reaches back to the days of the Roman Emperor Constantine. With the Conspiracy, a Christian order dedicated to stopping them and the law all trying to get to Rick first, he doesn’t know where to turn. There were only two chapters that I found disappointed me, and I think it was more that if they switched the order of them in the book it would have made more sense. All in all, it was a good concept but the conspiracy was a bit outrageous in their goals. I do recommend this book if you want an entertaining, light reading experience. If you’re looking for a heavy-hitting mystery and suspense, stick to Dan Brown or Steve Berry. “Book has been provided courtesy of Baker Publishing Group and Graf-Martin Communications, Inc. Available at your favourite bookseller from Revell, a division of Baker Publishing Group“.